We have had an influx of visitors from back home in NYC (I love it!). And of course if people come over, I have to cook because that is just how I operate. Lately I have been swamped with work and toddler changes/tantrums, prepping my food every day for Whole30 and resisting that which I should not eat. So when guests come to town, if I don’t have anything prepped or time on my hands I need to come up with quick dishes. My fridge is overflowing with squash purees, so I decided to make her a pasta with a cayenne spiced pumpkin goat cheese sauce. My husband and friend loved it and I was drooling, frustrated I could not eat it. So of course I began to create a compliant recipe in my head and made it the very next day – gluten-free, dairy-free, white wine-free full of whole foods. Instead of spaghetti noodles, I used spaghetti squash. Instead of pumpkin, I used butternut squash just to change it up. Instead of goat cheese, I used cashew cream and nutrional yeast. Instead of white wine, I used lemon juice. And added kale and pistachios. Heavenly. I had three servings. I need little snacks to munch on when I leave the house or finish working out – something quick, just a few bites and that will sustain me. I often grab a few nuts and a piece of fruit, but sometime I just want something else. So I decided to stock my counter top, fridge and freezer with some small bites that will carry me through the day – so anticipate several posts based on some form of a quick bite. 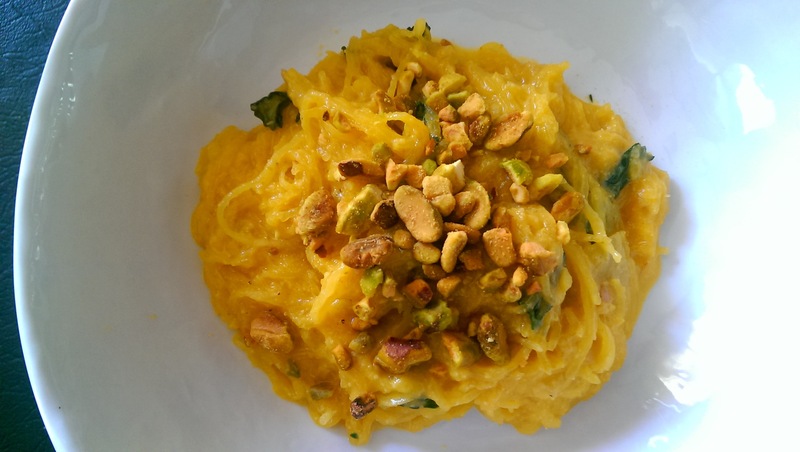 This recipe uses fresh pumpkin, ground flax, macadamia nuts, spices and an optional protein powder covered in pistachios, sunflower seeds or coconut to make little cold energy bites. The perfect on the go food.